The Fiske School district encompasses a diverse school population. We believe that our diversity is clearly one of our many strengths. Children are valued and respected for who they are and opportunities are provided for them to be able to share their talents and contribute to the school community. Fiske School is child centered, a place where each child is looked at as an individual and encouraged and challenged to reach their full potential. Teachers continually strive to meet each child’s individual learning style and needs to help develop confident independent learners. In addition to the Wellesley Public School’s Core values of Excellence, Cooperative and Caring Relationships, Respect for Human Differences and Commitment to Community, the Fiske Community practices the Fiske Fundamentals: Fair, Inclusive, Safe, Kind and Encouraging. Students are empowered and taught to take responsibility for their school community through the Fiske Student Council. Each term students organize a community service activity and a school spirit activity. We find Fiske School to be a special place. Our teachers take pride in providing a nurturing yet challenging learning experience while our parents take pride in consistently supporting our school. 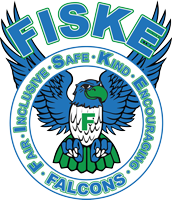 We believe that Fiske School is a thriving school due to the collaborative commitment and effort of parents, teachers and students. Building a partnership between school and home establishes a sold foundation towards reaching our common goal: the success of each child.